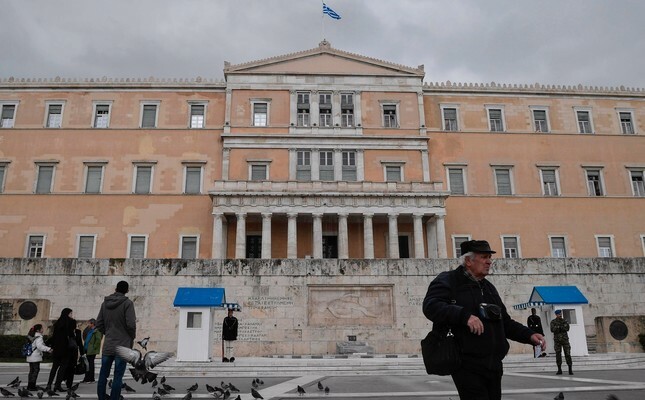 People walk in front of the Greek Parliament, central Athens, Feb. 8, 2019. When a deal was reached at Prespa between Greek Prime Minister Alexis Tsipras and his counterpart from Northern Macedonia, Zoran Zaev, regarding the tiny country's name change, it was a signal to the European Union, NATO and the rest of the world that the two countries were finally starting to get along. However, while the respective governments of Greece and Northern Macedonia may have reached a deal, antagonism between the two country's citizens is as hot as ever. Greeks have long seen Macedonia's adoption of its name, as well as the claim that Alexander the Great was one of their national heroes, and indeed other claims on different meals and so forth, as cultural appropriation. The row between the two has been going on since the small country became independent in 1991 after the collapse of Yugoslavia and decided to adopt the word Macedonia as well as other aspects of Macedonian cultural heritage. While Athens may have lifted its veto on Northern Macedonian's NATO and EU memberships, the move does not reflect how Greeks or Macedonians view each other; as was showcased by an article written in The Sunday Times in January, which explained that Greeks were surprised to find that Macedonians were serving Moussakas, a beloved Greek dish, under the state seal of the Former Yugoslav Republic of Macedonia, or FYROM, as it's known in Greece. It wasn't just Moussakas that was "advertised as Macedonian" according to one restaurateur from Corfu, Anastasis Paipetis, "They were [also] serving Greek yogurt and coffee as their own, as well." In fact, many products will be undergoing a "review" over the next three years by a committee to decide which ones may use the prefix "Macedonian," according to a report by John Psaropoulos. Despite being widely praised by both EU and NATO officials regarding the name-change deal, both Athens and Skopje have been ignoring public opinion in their respective countries. Greece, in particular, has been in uproar with protests ever since it was announced that Tsipras was even considering holding talks with Zaev. While official polling has not been conducted, it is estimated that well over two-thirds of the nation disagrees with the acceptance of having the word "Macedonia" implemented into the country's name, while many have been critical of Zaev's talks with Tsipras back in Skopje as well, albeit for different reasons, saying that he conceded too much to the Greeks. Regardless of public opinion, Greek Parliament ratified NATO accession protocol for Northern Macedonia with 153 votes in favor and 140 against out of 300, with one member of parliament abstaining. While non-Greek and non-Northern Macedonian media may be boasting a long-awaited normalization of relations, nothing could be further from the truth when it comes to antagonism between the two nations on a cultural level.